Taking time off work with stress is being used as a powerful strategic tool by some disgruntled employees who feel powerless in the workplace and have no other way of expressing their grievance, a leading psychiatrist has claimed. But he warns that this can divert attention away from unfairness and injustice at work. Dr Maurice Lipsedge, an emeritus consultant psychiatrist at South London and Maudsley NHS Foundation Trust, was addressing the Royal College of Psychiatrists' International Congress in Edinburgh. He told delegates that the social, economic, political and medical context of a culture influenced how people react to pressure at work. With the weakening trade unions, disaffected employees who had little power over their working conditions tended to engage in the "infrapolitics of the weak" by turning up late and leaving early, making deliberate mistakes, taking long breaks, working unnecessary overtime, spreading negative rumours about employers and - the most popular tactic - by taking time off sick. Dr Lipsedge said: "People nowadays have a cultural template of how to behave when you feel overwhelmed at work, which is call in at the GP and get a certificate. Once you've got your doctor's note you can't be accused of malingering," he told the Congress. Some 10 million working days a year are lost due to work-related mental health problems, according to a report published in 2007 by the Sainsbury Centre for Mental Health. But Dr Lipsedge says sickness caused by work is not a modern phenomenon. In the 1780s women working in the Lancashire cotton mills collapsed due to the atrocious conditions under which they were forced to work. They were "diagnosed" as suffering from "hysteria" and given "electric therapy" with a portable electric shock machine to make them docile and compliant. Two hundred years later, workers in several Malaysian electronic factories, powerless in the face of a tyrannical management, poor working conditions, low wages and the banning of trade unions, collapsed with convulsions and hysteria. Dr Lipsedge told delegates he believed that the recent suicides of the Chinese workers in a Shenzhen electronics factory were an "extreme" form of resistance taken by employees who could see no other way of changing their terrible working conditions. Dr Lipsedge said the disadvantage of the common pattern of a disgruntled employee consulting a doctor and being issued with a medical certificate was that the consultation shifted the focus away from the workplace and into the medical realm. "It depoliticises workplace conflict, perceived unfairness and injustice are not remedied, and medicalisation maintains the status quo." He said there was a clear distinction to be made between involuntary sickness absence because of a major mental illness, and "elective" absence which was, he said, an overt expression of resentment. "Few people are malingerers. However, some people do react in this way because they have unreasonably heavy workload, are not consulted in decision-making, are unfairly treated, feel powerless and don't have access to trade unions. Twenty or thirty years ago they would have been on the picket lines - today they take time off with stress. This is the reason for the stress epidemic. There is no direct confrontative option." 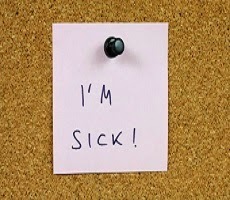 Taking time off work because of stress-related sickness was a way disempowered employees acted out the indignation and anger at the way they were being treated, said Dr Lipsedge. "Is at is an oblique form of resistance, a strategic tool to redress the balance for those employees who feel powerless in the workplace." However, it was a strategy that played into the hands of some employers, who were all too happy to lose disruptive and unhappy workers to long-term sick leave. References: International Congress of the Royal College of Psychiatrists, Edinburgh.